Come for the whole day, for the whole family at the Mt. 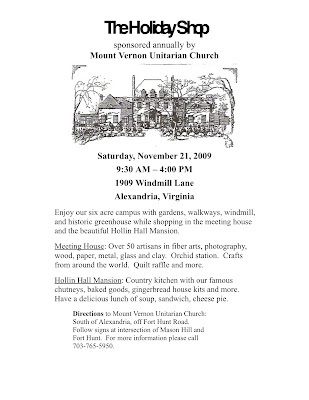 Vernon Unitarian Church Holiday Shop. For the 48th year, this happening encompasses baked goods, handmade crafts from well know regional artists, hot lunch to buy, fair trade items, a quilt raffle and more. A beautiful drive down the George Washington Parkway and a cute little setting create a great day out!